Revit (BIM) Managers typically use the Revit SAVEAS Command and its "Compact File" Option to reduce a Revit project file size. Bradley uses this process, as one of the last procedures; that we apply to reduce the file size of our final Revit Family models. It's pretty common, to build a Bradley Revit family product model; that may be 800K in file size. However, once we use this 'compact file' process; the file size may be reduced by over 50%. Consider testing this procedure on your Revit family library models or Revit family content; that you download from other Revit libraries. 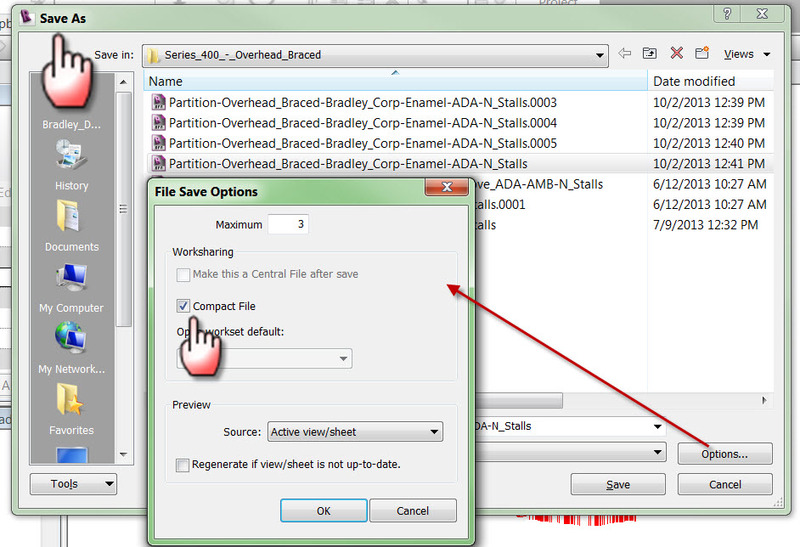 Remember to delete or purge unused content within your families (materials, nested families, subcategories, CAD files, line patterns); prior to using this "Compact File" procedure in the Revit SAVEAS command.